good taste and content specifics. 98% Approval of submitted sites. 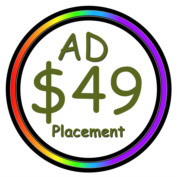 Click on the Ad to the Right - $49.00 for a full 12 Months Prominent Advertisement. for you. We'll use Imagery from your site and Blend together an Eye Catching Banner.